The gray, rainy day drove our little group into the local history museum. We enjoyed our 90-minute tour but were ready for a tasty lunch from one of the excellent restaurants in historic Fernandina Beach, Florida. We exited the museum and discovered the rain had stopped, at least for the moment. As I turned the corner of the old brick building to head to the car, these bright berries quickly caught my eye. 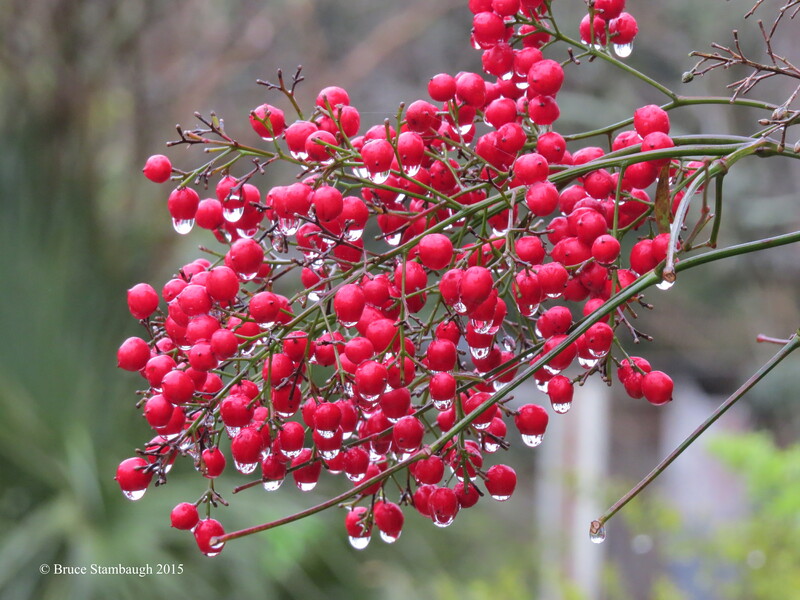 I loved the way the glistening raindrops, ready to drip, made the berries shine. Their fire engine red brightened the dull day. “After the rain” is my Photo of the Week. While I don’t always comment, I really enjoy seeing your photos. I wish you had a “like” button! Thanks for sharing! Thanks for “liking” my photos. I’m glad you enjoy my photos. And I do have a “like” button. It should be right under the “Facebook” button. If you don’t see it, please let me know. Thanks, again, for following along. Very well done. I like the simple things in life myself, it’s something few would think to even photograph. Thank you very much, Katie. I love the little things, too.